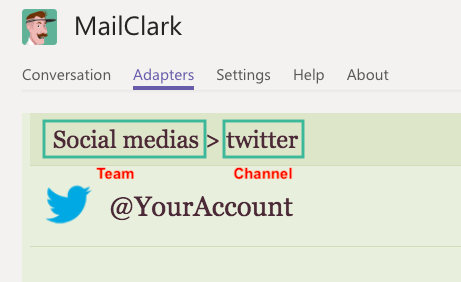 Is your Twitter account connected to a channel? Even if you know that you've already connected it to Teams, maybe a colleague disconnected it by mistake? A quick check won't hurt! Go to your Adapter list to make sure it is connected. Have you set up your account to receive only DMs or only Tweets you're mentioned in? You're account is connected and you've set it up as expected? If none of the steps above resolve the issue, send us a message, we'll look at it together!